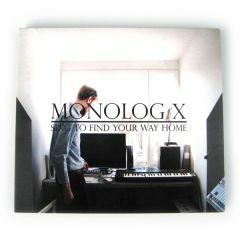 “Sing To Find Your Way Home” is the second full length album by Stockholm based producer Johan Eriksson-Degerlund under the his moniker Monolog X, it is also his debut release on WR. Over the past few years Monolog X has released a hand full of impressive digital EPs on various net labels around the globe and one full length album titled “The Shape Of X To Come” in 2012. In 2014 Monolog X put his first physical release, a Cassette EP titled “Seven Trumpets” on the excellent Colorado based label Occult Research. Sing To Find Your Way Home is somewhat of a sequel to The Shape Of X To Come and it proves to be quite an ambitious one at that. Monolog X is a true composer utilizing a variety of acoustic and electronic instruments to create his complex and highly emotive sound. Sing To Find Your Way Home is a true statement piece, covering a whole lot of varied musical terrain from electronic braindance/acid tunes to classical compositions and introspective ambient works. A truly dense listen that takes you through a dreamlike world of light and dark atmospheres. In many ways this album feels a human as it does android. Recommended for fans of early Warp acts (Plaid, Autechre and Aphex Twin etc…). Mastered by The Analog Botanist. Limited edition CD housed in a full color matte finished digipak CD case.